No double dipping - except when it's for Bing cherries! 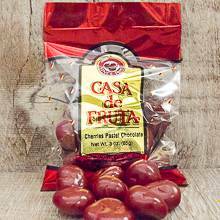 This perfect sized bag is filled with individual dried Bing cherries covered in rich milk chocolate and then coated with pastel chocolate. A delicious treat for any occasion! Packaged in a 3 oz. bag.